Weather conditions on Adriatic are determinate by positioning cyclone and anti-cyclone over Central and Southern Europe. The usual direction of cyclones movement is from the west to the east. It brings warm and moist winds southerly directions and that cause rainy weather. On Adriatic usually blows Jugo wind. When anticyclones start raising in Europe to the east, the wind turns to the northeast and brings cold and dry air. On Adriatic usually blowing Bura wind. Bura wind disperse rain clouds and brings clear blue sky.Weather is stabile and sunny until the next cyclone. The air temperature may be lower for a few days. Even there are significant difference in the climate of the northern and southern Adriatic, these changes are minimal during the summer. Climate brings plenty of sunny days and high temperatures on the whole Adriatic. Daily temperatures range from 28 to 35 degrees. Night temperatures are higher year by year, usual from 24- 30 degrees. Temperature of the sea is generally between 23- 28 C during the summer. In mid- September temperature begins to drop because of the temperature difference between day and night. First begins to falling down in the northern Adriatic and after a while in the southern part. Basically, the Adriatic is a great place for sailors most of the year. 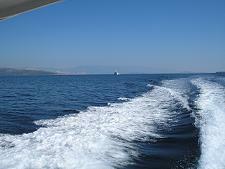 The best time to sail on Adriatic is from early April until the end of October. The summer months of June, July and August are a center of tourist season. There are plenty of charter boats at the sea, a lot of tourists and happenings. In these months could be to crewed and difficult to find free berth in some attractive places on Adriatic. April, May as well as September and October are not overcrowded but still with nice weather conditions. The winds were a bit stronger than in the top season. Daily temperatures are still high and tempting to swim. During this period there are numerous regattas.